潘永露, 何淑芳, 韩正怡, 窦梦云, 杨婉, 程洁, 陈志武, 张野. Fas/caspase-8/3和ERK信号通路在Fas siRNA减轻心肌细胞缺氧/复氧损伤中的作用[J]. 中国药理学通报, 2018, 34(8): 1150-1157. PAN Yong-lu, HE Shu-fang, HAN Zheng-yi, DOU Meng-yun, YANG Wan, CHENG Jie, CHEN Zhi-wu, ZHANG Ye. Roles of Fas/caspase-8/3 and ERK signaling pathways in Fas siRNA induced reduction of hypoxia/reoxygenation injury to cardiomyocytes[J]. Chinese Pharmacological Bulletin, 2018, 34(8): 1150-1157. Abstract: Aim To evaluate the roles of Fas/caspase-8/3 and extracellular signaling-regulated kinase (ERK) signaling pathways in Fas siRNA induced reduction of hypoxia/reoxygenation (H/R) injury to cardiomyocytes. Methods H9c2 cardiomyocytes were cultured in DME/F-12 culture medium supplemented with 10% fetal bovine serum and randomly divided into four groups (n=3 each) using a random number table: control group, H/R group, Fas siRNA group (H/R+Fas-siRNA) and siRNA control group (H/R+siRNA-NC). H9c2 cardiomyocytes were cultured in normal culture atmosphere in control group; treatment with 5 h hypoxia and 1 h reoxygenation was carried out to H9c2 cells to establish H/R injury in group H/R. In addition, the H9c2 cells in groups H/R+Fas siRNA and H/R+siRNA-NC were transfected with Fas siRNA and Fas siRNA-NC for 24 h before H/R injury, respectively. Cell viability was determined using CCK-8 method, lactate dehydrogenase (LDH) activity in the culture medium was detected using chemical colorimetry, and cell apoptosis was assessed using Annexin-V-FITC/PI flow cytometry in each group at the end of treatment. Relative expression of Fas mRNA was detected by fluorescent quantitative RT-PCR, while the levels of Fas, caspase-8/3, ERK, GSK-3β protein were observed by Western blot. Results Compared with control group, cell viability was significantly repressed, and LDH activity and apoptotic rate as well as the expression of Fas mRNA, protein, and cleaved caspase-8/3 protein and p-ERK, p-GSK-3β protein all increased in group H/R (P < 0.05), while Fas siRNA alleviated H/R injury when compared with group H/R, as evidenced by the significantly increased cell viability, and further proved by the suppressed LDH activity and apoptotic rate as well as the expression of Fas mRNA, protein and cleaved caspase-8/3 protein. In addition, p-ERK, p-GSK-3β protein expression increased in group H/R+Fas siRNA (P < 0.05). There was no difference in the parameters mentioned above in group H/R+siRNA-NC. Conclusion Fas/caspase-8/3 and ERK signaling pathways play an important role in the alleviation of H/R injury by Fas siRNA in cardiomyocytes. 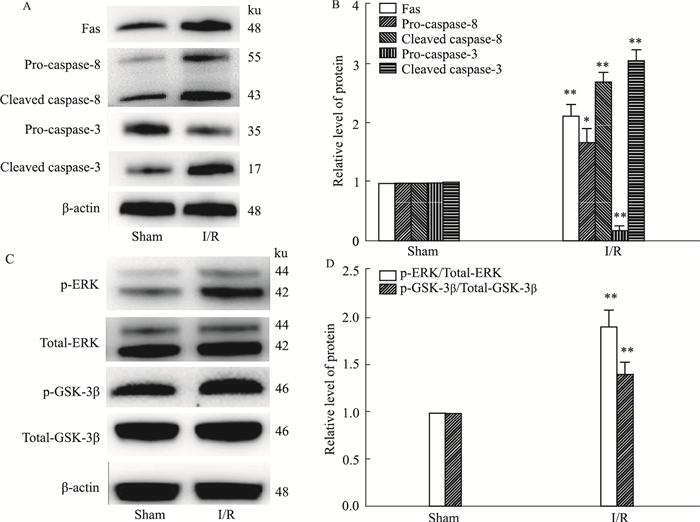 Fig 1 Expressions of Fas/caspase-8/3 and ERK/GSK-3β protein induced by I/R injury in hearts (x±s, n=3) A, C: Fas and caspase-8/3 and ERK/GSK-3β protein expressions were detected by Western blot, and β-actin was set as internal control for sample loading; B, D: Intensities of protein bands were normalized to β-actin. *P < 0.05, **P < 0.01 vs sham. Fig 2 Transfection efficiency of Fas siRNA and screening of effective Fas siRNA in H9c2 cardiomyocytes (x±s, n=3) A: The transfection efficiency was monitored with a Cy3-labelled control. Bar=50 μm; B: The level of Fas mRNA was detected by qRT-PCR and was normalized to β-actin mRNA; C: Western blot analysis of Fas and β-actin protein; D: The relative protein expression of Fas bands was normalized to β-actin. **P < 0.01 vs control; #P < 0.05 vs Fas-siRNA2. Fig 3 Fas siRNA reduced H/R injury in H9c2 cardiomyocytes (x±s, n=3) A: The viability of cardiomyocytes was measured by CCK-8 method; B: Cell injury was determined via detecting LDH release; C: Cell apoptosis was measured by Annexin V-FITC/PI flow cytometry; D: The apoptotic rate was expressed as the percentage of cells at early apoptotic stage (the lower right quadrant). **P < 0.01 vs control; ##P < 0.01 vs H/R. Fig 4 Fas siRNA decreased Fas mRNA, protein and caspase-8/3 protein expression in H9c2 cardiomyocytes (x±s, n=3) A: The level of Fas mRNA was detected by qRT-PCR and was normalized to β-actin mRNA; B-D: Fas, caspase-8/3 protein expressions were detected by Western blot, and β-actin was set as internal control for sample loading. Intensities of protein bands were normalized to β-actin. **P < 0.01 vs control; #P < 0.05, ##P < 0.01 vs H/R. Fig 5 Fas siRNA increased ERK, GSK-3β protein expression in H9c2 cardiomyocytes (x±s, n=3) A: ERK and GSK-3β protein expressions were detected by Western blot, and β-actin was set as internal control for sample loading; B: Intensities of protein bands were normalized to β-actin. **P < 0.01 vs control; ##P < 0.01 vs H/R. Minamino T. Cardioprotection from ischemia/reperfusion injury[J]. Circ J, 2012, 76(5): 1074-82. Wang F, Liang G Y, Liu D X, et al. Effect of si-RNA-silenced HIF-1α gene on myocardial ischemia-reperfusion-induced insulin resistance[J]. Int J Clin Exp Med, 2015, 8(9): 15514-20. Filippone S M, Samidural A, Roh S K, et al. Reperfusion therapy with rapamycin attenuates myocardial infarction through activation of AKT and ERK[J]. Oxid Med Cell Longev, 2017, 2017: 4619720. Chinese Pharmacological Bulletin, 2018, 34(8): 1150-1157.